North East-based Jennings Motor Group has today announced it has joined forces with one of the UK’s fastest growing car brands, Kia. Sept. 12, 2011 - PRLog -- Jennings Kia has officially opened its doors to motorists across Wearside, following the investment of a new franchise based on Parsons Road in Washington, Tyne and Wear. Jennings Motor Group, which is independent and privately owned, is one of the region’s longest-established companies having been founded in 1903 and becoming one of the UK’s first Ford dealers in 1917. The Group currently operates five Ford dealerships located in Wearside, Tyneside and Teesside. 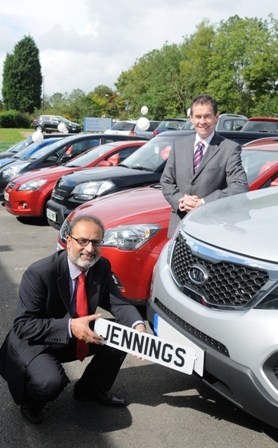 Over the last decade, Jennings has invested heavily in the North East following the expansion of the business into a multi-franchise group with the introduction of two Mazda sites and a SEAT franchise. The company currently employs a total of 457 people, which includes 22 sales, service and parts staff based at the Washington branch. A combination of customer and staff loyalty has played a pivotal role in the company’s continuing success and achievements. The new Jennings Kia dealership will offer the whole Kia range which includes a wide variety of quality models at highly competitive prices, in addition to a peace of mind 7-year warranty package. Everything from compact vehicles including the all-new Rio, the ‘Small, yet mighty’ all-new Picanto, the Soul and Venga models and family hatchbacks including the cee’d, cee’d SW and pro_ceed models, to practical and stylish multi-purpose vehicles including the Carens and Sedona and the powerful yet efficient sport utility vehicles including the Sportage and Sorento will be available to test drive. The opening of the new franchise coincides with the launch of Kia’s all-new Rio model and the new ‘61’ registration plate change. The new Kia Rio is a major step forward in the manufacturer’s relentless drive to upgrade the style and quality of its entire model range while hammering down fuel consumption and C02 figures. The new Kia Rio will be available with four engines – two petrol and two diesel – including a 1.1-litre three-cylinder turbodiesel with lower fuel consumption and C02 emissions than any other non electric car on sale in the world, including hybrids and eco specials from rival companies. Customers will also be able to take advantage of the group’s existing parts and service department based on Parsons Road in Washington for their aftersales requirements. To celebrate the launch of Jennings Kia, customers who order and register a new vehicle before the 30 September 2011, will be walking away with shopping vouchers to the value of £200. Jennings Motor Group is an independent, privately-owned company operating Ford, Mazda, SEAT and Kia dealerships across the North East of England.